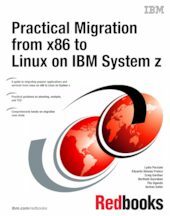 This IBM Redbooks® publication provides a technical planning guide and example for IT organizations to migrate from their x86 environment to Linux on System z. It begins by examining the benefits of migrating workloads to Linux on System z. Here, we describe the workload centric method of information technology and then discuss the benefits of migrating workloads to Linux on System z. Next, we describe total cost of ownership analyses and we guide you in understanding how to analyze your environment before beginning a migration project. We also assist you in determining the expected consolidation ratio for a given workload type. We also describe virtualization concepts along with describing the benefits of migrating from the x86 environment to guests residing on an IBM z/VM® single system image with live guest relocation. This IBM Redbooks publication walks you through a migration approach, includes planning worksheets, as well as a chapter to assist you in analyzing your own systems. We also discuss post migration considerations such as acceptance testing of functionality and performance measurements. Migrate not just your servers, migrate your infrastructure to IBM System z! Don’t tell me Cloud on System z - these machines were already born for cloud.